Exercises focus on a groundwater flow system and management problem, enabling readers to apply all the methods presented in the text. The exercises can be completed using the material provided in the book, or as hands-on computer exercises using instructions and files available on the text's accompanying Web site. Throughout the book, the authors stress the need for valid statistical concepts and easily understood presentation methods required to achieve well-tested, transparent models. 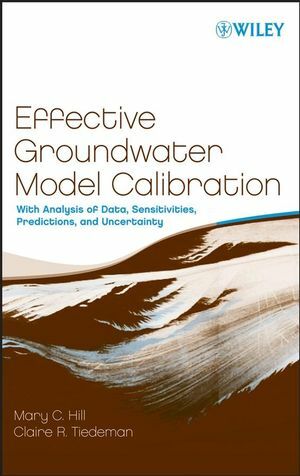 Most of the examples and all of the exercises focus on simulating groundwater systems; other examples come from surface-water hydrology and geophysics. MARY C. HILL, PhD, is Project Chief for the U.S. Geological Survey (USGS) and a recipient of the USGS Meritorious Service Award, the ASCE Walter Huber Research Prize, and the NGWA M. King Hubbert Award. Dr. Hill is President of the International Commission for Ground Water. She is Adjunct Professor at the University of Colorado at Boulder and the Colorado School of Mines. CLAIRE R. TIEDEMAN, MS, is a Research Hydrologist at the U.S. Geological Survey, where her work involves calibrating and evaluating models of complex groundwater flow systems, developing methods to evaluate prediction uncertainty, and characterizing flow and transport in fractured-rock aquifers. She is a recipient of the USGS Superior Service Award and an Associate Editor of the journal Ground Water. 2.1 Computer Programs MODFLOW-2000, UCODE_2005, and PEST. Exercise 2.1: Simulate Steady-State Heads and Perform Preparatory Steps. 3.1 Weighted Least-Squares Objective Function. Exercise 3.1: Steady-State Parameter Definition. Exercise 3.2: Observations for the Steady-State Problem. 4 Determining the Information that Observations Provide on Parameter Values using Fit-Independent Statistics. 4.3 Fit-Independent Statistics for Sensitivity Analysis. 4.4 Advantages and Limitations of Fit-Independent Statistics for Sensitivity Analysis. Exercise 4.1: Sensitivity Analysis for the Steady-State Model with Starting Parameter Values. Exercise 5.1: Modified Gauss–Newton Method and Application to a Two-Parameter Problem. Exercise 5.2: Estimate the Parameters of the Steady-State Model. 7.2.4 Statistics for Log-Transformed Parameters. 8.3.3 Insights About the opr Statistic from Other Fit-Independent Statistics. Guideline 3: Maintain a Well-Posed, Comprehensive Regression Problem. A.1 Derivation of the Maximum-Likelihood Objective Function. A.2 Relation of the Maximum-Likelihood and Least-Squares Objective Functions. B.2 Quasi-Newton Updating of the Normal Equations. Additional Information for Professionals, Students, and Instructors Discover associated exercises, answers, software, and PowerPoint files.